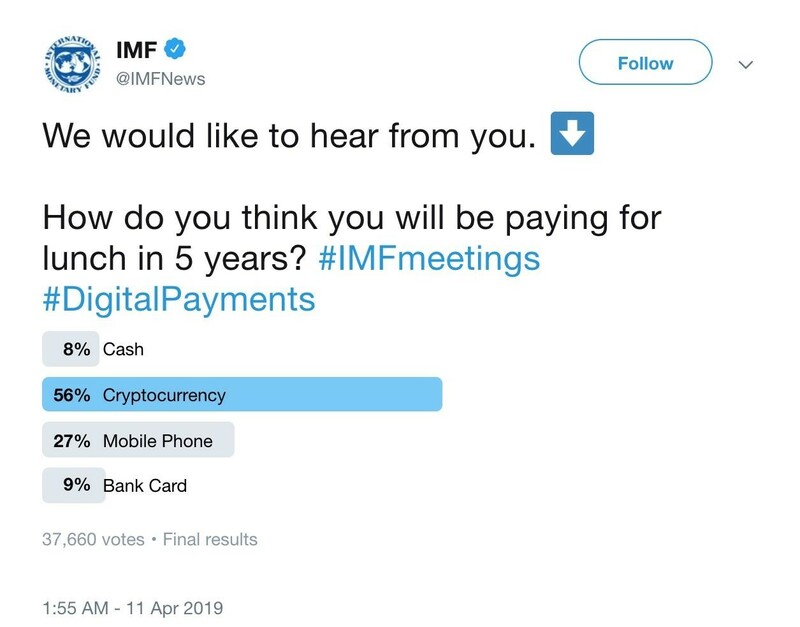 The International Monetary Fund (IMF) official Twitter account ran a poll yesterday, asking “How do you think you will be paying for lunch in 5 years?” - the poll saw nearly 38,000 votes since then, and surprisingly (or unsurprisingly) ‘Cryptocurrency’ got the highest number of votes, followed by ‘Mobile Phone’, ‘Bank Card’ and ‘Cash’. Under the original Tweet, however, XRP supports came in full force to shill XRP to anyone and everyone, including the IMF itself. XRP is currently the third largest digital currency after Bitcoin and Ethereum, and is mainly aimed at helping financial institutions make cost-efficient and fast cross-border high-value transactions. Cryptocurrencies (not just XRP) have a vast majority of proponents online, especially on platforms such as Twitter and Reddit, who truly believe that digital currencies are the future and Bitcoin (and others) can actually replace fiat currencies in the years to come. Meanwhile, Bitcoin has come a long way from being an ‘underground’, ‘internet play-money’ of sorts to the poster-coin of a legitimate new asset class recognized by top financial institutions and service providers such as CBOE, CME, Fidelity and ICE. “I think the role of the disruptors and anything that is using distributed ledger technology, whether you call it crypto, assets, currencies, or whatever...that is clearly shaking the system,” Lagarde said. The latest example of the freedom afforded by cryptocurrencies comes in the form of donations being sent to WikiLeaks as news broke about its co-founder Julian Assange finally being arrested in the UK.